My recently purchased, slightly retro Thinkpad X61s. The spiritual successor to my beloved x40, it briefly inherited that laptop's name, qusp, but I've now assigned that to my new work laptop (a T470s). The intention for this was to help wean me off the Macbook Pro I was using as my main machine. Now I am evaluating whether to keep it as my spare/play/backup machine, versus my Toshiba Portégé R600. 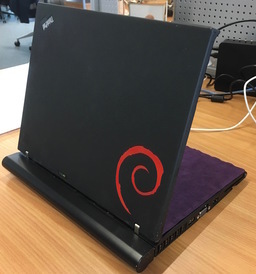 I prematurely committed my last foil Debian swirl sticker to it, which I should have kept until I'd made up my mind what I was doing! I originally bought one of these from eBay because it was fitted with the higher quality IPS screen with a much better resolution (panel HV121P01-101). I was also really keen to finally try out a digitizer-on-display, something I've been interested in trying since I was a graphics design student in the 1990s. Unfortunately the laptop had completely broken USB (and a marked display that didn't look to be fixable) so I ended up throwing it away.